One weekend last spring Kathryn and I found ourselves unencumbered by the kids and their sports schedules, so we set off on a quick 24 hour weekend getaway. 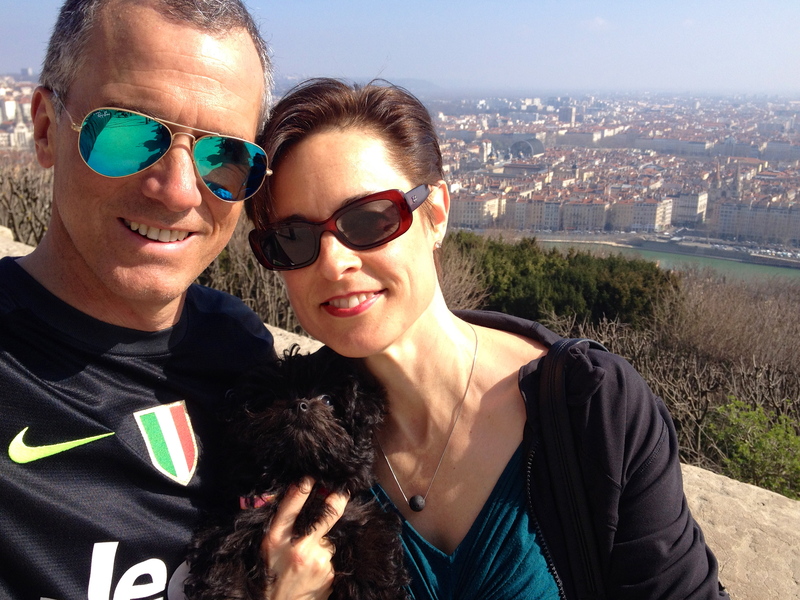 Our destination of choice: the city of Lyon, France, about which we had heard many good things from other expats. This was also our first experience of traveling with our new dog, Coelle, who had been with us for about a month. What better place to take her on her first trip than the dog-mad country of France? 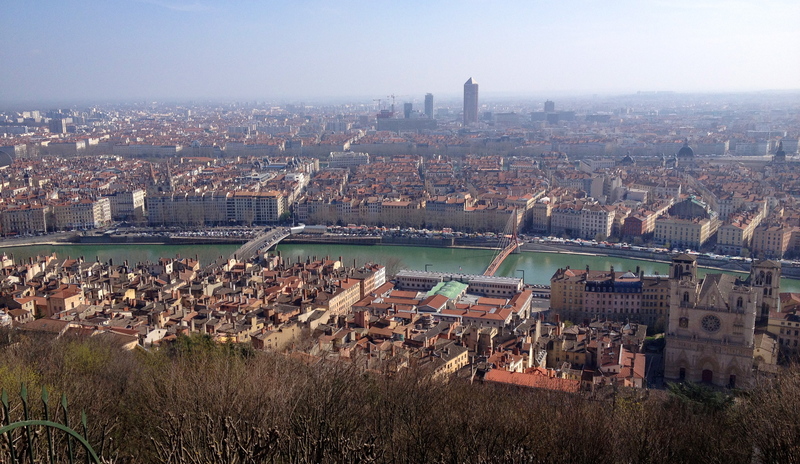 Lyon and the Soane river, as seen from Fourviere. At just over 2 million people, Lyon is France’s 2nd largest city; but while it is well-known among foodie-types as a centre of French cuisine, most of us are hard-pressed to conjure up a mental picture of the city, let alone find it on a map. Lyon is located in the eastern part of France, just over 2 hours from Paris by a fast train. Luckily for us, as it turns out, Lyon is quite close to Switzerland, lying about 2 hours west of Geneva. Far enough away to feel like a real destination, but close enough that we wouldn’t spend half the weekend sitting in the car. 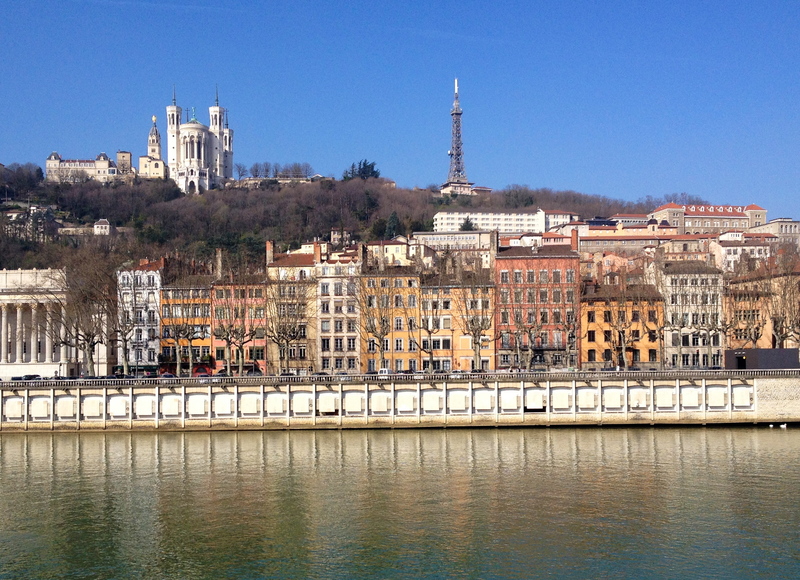 Vieux Lyon and Fourviere hill, as seen from the banks of the Soane. The Basilica of Notre Dame de Fourviere (left) sits on top of the hill. The city of Lyon was originally founded in 43 BC as a Roman settlement at the confluence of the Soane and Rhone rivers, two of France’s largest rivers. 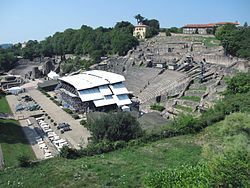 Before long Lyon – or Lugdunum as it was then known – became the capital of Gaul, then a province of the Roman Empire, that stretched across much of what is modern France. Overlooking the west bank of the Soane is a high escarpment called the Fourviere hill, and it was here that the Romans built a massive amphitheatre with seating for 10,000. Lyon is known as the “City of Light,” a label more often associated with Paris. Lyon, however, boasts an annual “Festival of Lights” dating back to medieval traditions. According to city lore, Lyon was spared the worst ravages of a plague during the Middle Ages thanks to the intervention of the Virgin Mary. As a gesture of thanks, inhabitants placed votive candles in the windows of their homes. In the mid-19th century, following the erection of a statue of the Virgin at the top of Fourviere hill, residents again began placing candles in their windows and marched through the streets with candles and lanterns, a ritual that has been repeated every December 8th since. In 1999 the city of Lyon updated the tradition by holding its inaugural Festival of Lights, held every year on the weekend closest to Dec 8th. The festival features 4 nights of artistic lighting displays and monumental light shows projected onto the city’s most iconic historical buildings (see timelapse video below). One of these buildings, the Basillica of Notre Dame de Fourviere, was added to the hilltop in the 19th century, with a commanding view over the city. At the foot of the Fourviere lie the serpentine, cobble-stoned streets of old, medieval Lyon. On the opposite side of the Soane, on a peninsula formed just upriver from its confluence with the Rhone, lies the city’s bustling, modern downtown. Notre Dame de Fourviere, built in the mid-19th century. It was in the modern downtown core that we found ourselves at midday on a warmish Saturday in March, after an easy drive from Lausanne. Our hotel room overlooked the lovely Theatre des Celestins and its square, where dozens of lotus trees were already in bloom. 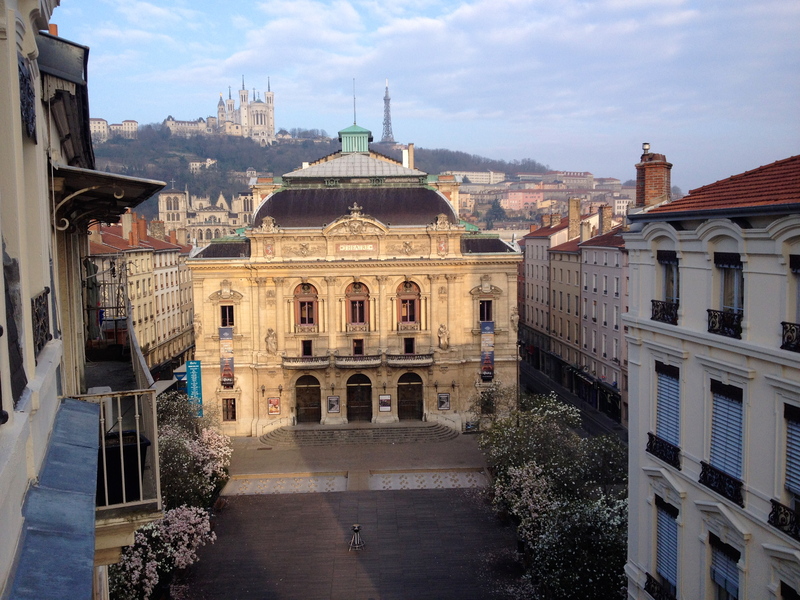 Pretty decent view of the Theatre des Celestins from our hotel room in downtown Lyon. We hit the streets of Lyon in search of refreshment, strolling through the downtown with Coelle on leash. This was one of her first experiences of the hustle and bustle of the city and, while she was showered with attention from the dog-crazy French, she was a bit frightened and overwhelmed. After a while we stumbled upon the Grand Cafe des Negotiants, a brasserie and dessert place with rich and colourful decor harkening back to the Belle Epoque. 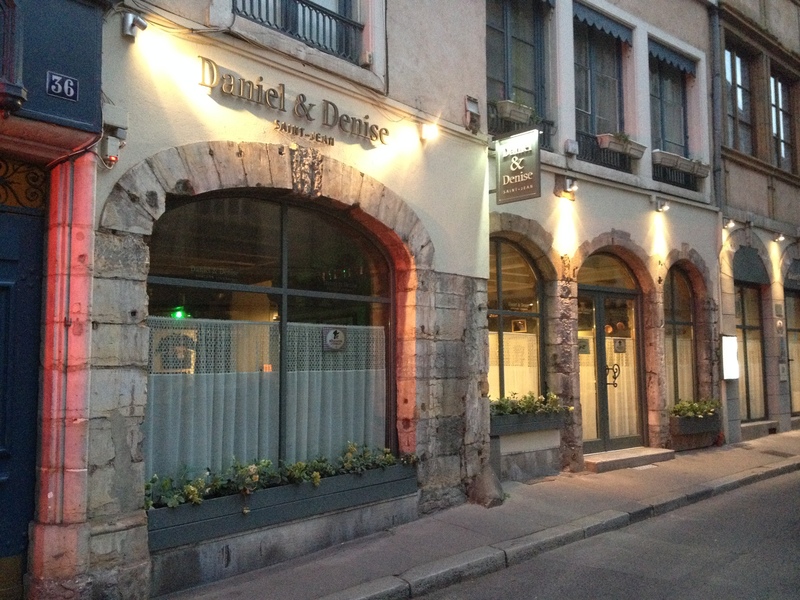 First opened in 1864, the Cafe is a virtual institution within the Lyonannais culinary scene, and we happened upon it purely by accident. We scarfed a plate of local cheeses washed down with a glass or two of wine before heading back to the hotel for a nap. 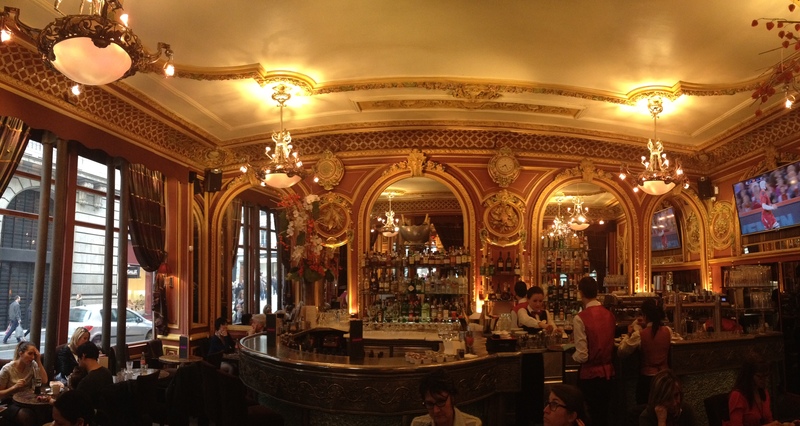 Grand Cafe des Negotiants, which first opened its doors in 1864. By early evening we were out the door again, heading across the Soane towards Vieux Lyon in search of dinner. Lyon has long been recognized as the capital of French cuisine, and is home to Paul Bocuse, founder of “nouvelle cusine” and one of the most celebrated and influential chefs in the world. The city boasts over 1,000 restaurants and is blessed with more restaurants per capita than almost anywhere else. 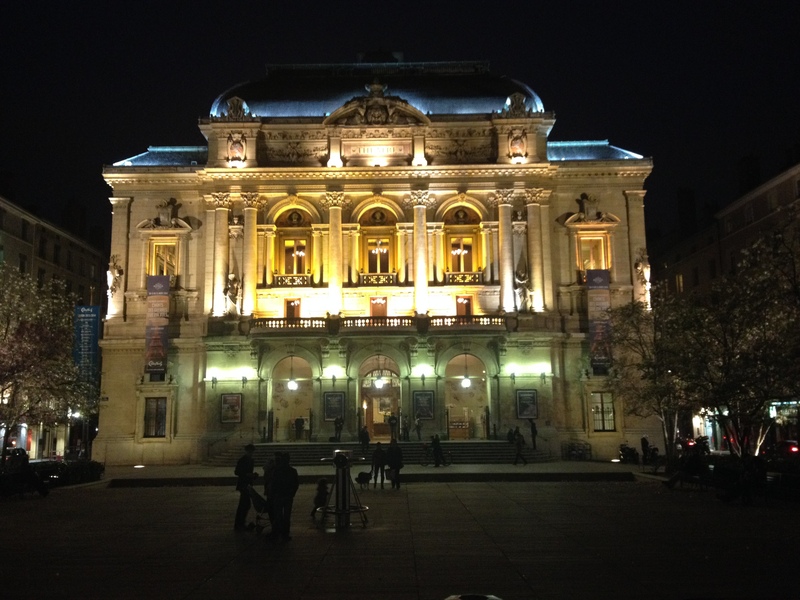 Theatre des Celestins at night. But while the city is now a mecca of “haute cuisine,” its reputation for producing just plain delicious food goes back centuries. Since the Renaissance at least, Lyon has been known for the simple yet hearty fare served up in its many inns and guesthouses, its reputation built through word of mouth and, later, celebrated in the works of writers such as Rabelais, Erasmus and Stendhal, who encountered the city’s distinctive cuisine during their travels across Europe. In the 16th century, Catherine de Medici, wife of King Henry II, is said to have enhanced the reputation of Lyonnais cuisine after her Florentine chefs further developed and refined a repertoire of standard dishes, which were often served to the nobility. 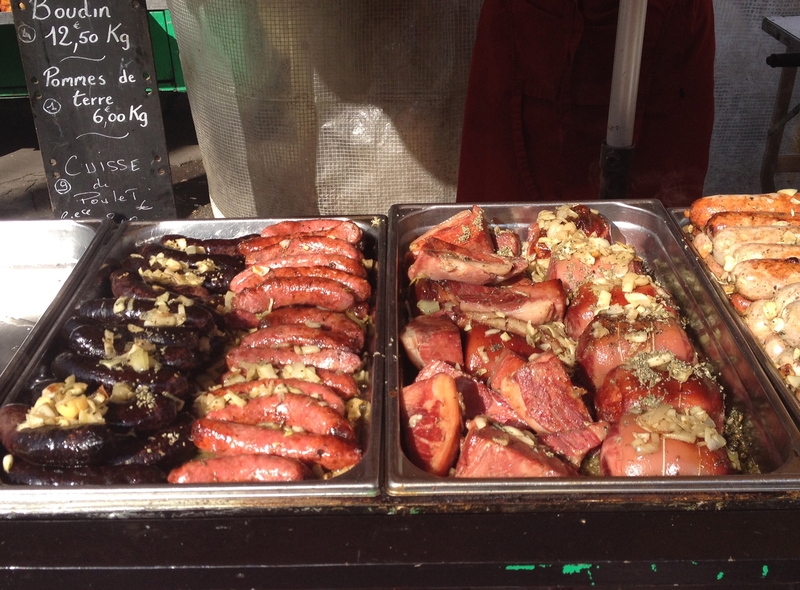 Lyonnais meats at the Sunday morning market. Traditional Lyonnais cuisine, or “bouchons Lyonnais”, consists of rich, hearty, and primarily meat-oriented dishes, including sausage, bacon, chicken, and assorted game, with a helping of offal and organ meat for good measure, often served in a rich sauce. 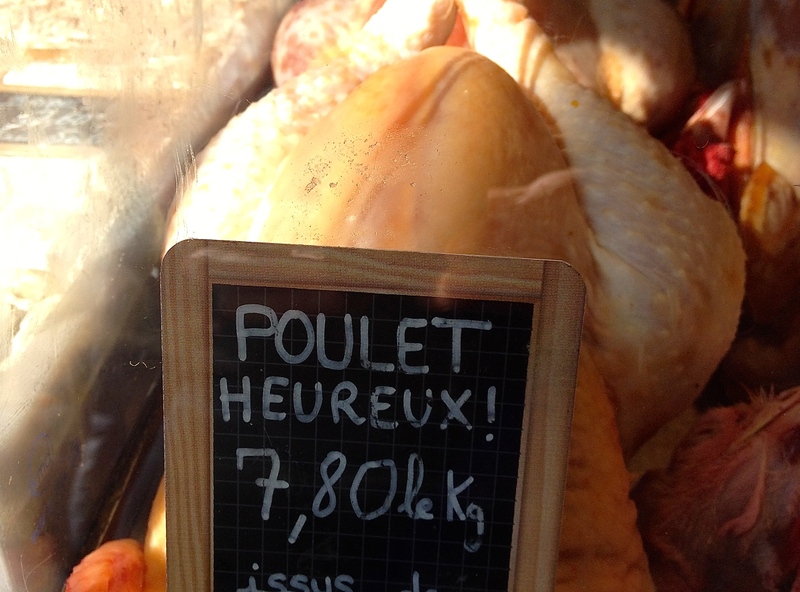 Among the more distinctive Lyonnais specialties are “Andouillettes” (a type of sausage made from tripe), “Coq au vin,” “foie gras,” and “Lyonnaise potatoes” (pan-fried sliced potatoes). Think of it as French comfort food, and don’t check the nutrition facts! Daniel et Denise in Vieux Lyon. 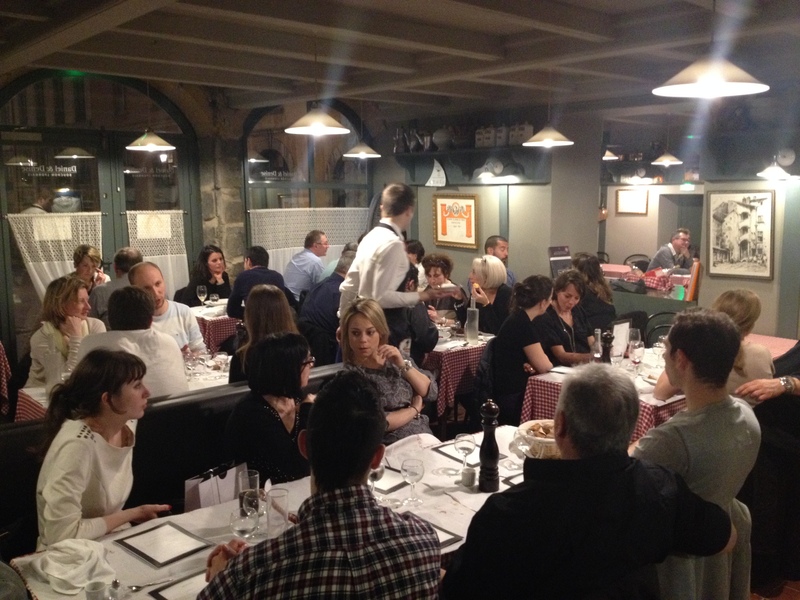 While Lyon boasts many top restaurants, including Bocuse’s own L’Auberge du Pont de Collonges (3 Michelin stars), there are dozens of traditional restaurants serving authentic “bouchons Lyonnais,” mostly concentrated in the city’s historic centre. Daniel et Denise is one of the better bouchons and luckily they had space for us that evening. The decor was simple and the friendly server showed us to our table, where we sat almost elbow to elbow with the guests on either side. The atmosphere was casual, friendly and festive. Along with our apertifs, the server also brought a water dish for Coelle! 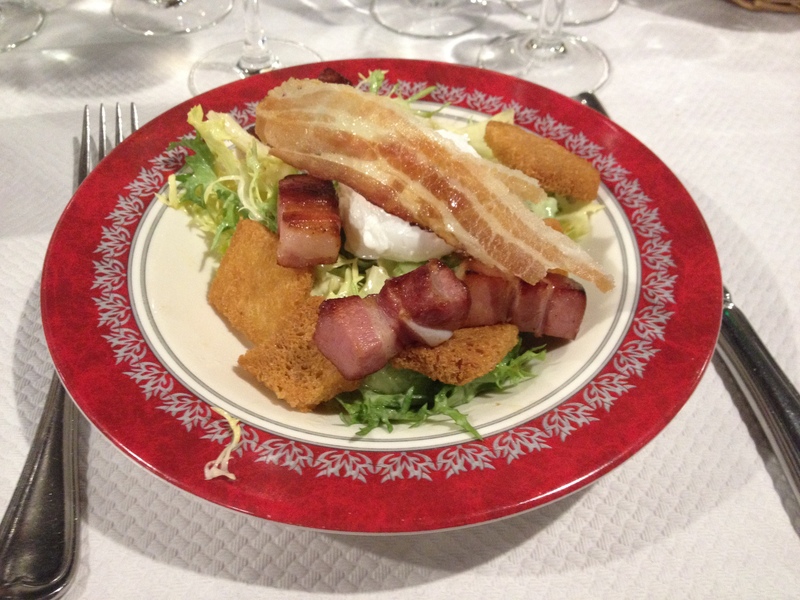 We started with a “salade Lyonnaise,” which was anything but a light appetizer! Along with the usual lettuce and croutons were sliced boiled egg and chunks of back bacon (“lardon”) the size of your thumb! For an entree I ordered the chicken in a mushroom cream sauce, washed down with the house red. For dessert we split a cheese plate and a creme brulee. I couldn’t resist the dram of Chartreuse offered as a digestif. Sampling the local bouchons fare was definitely one of the highlights of our stay, but I couldn’t eat that way very often without doubling in size! 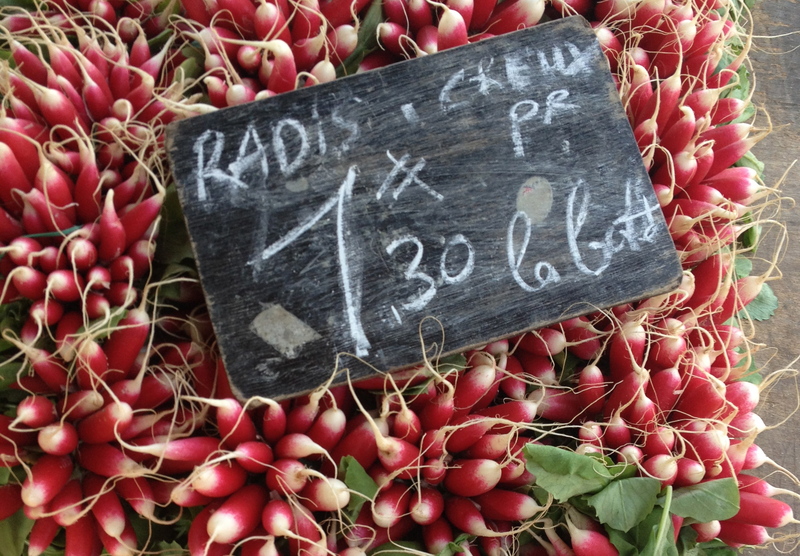 Lyon may be the City of Light, but the cuisine that made it famous is definitely not! 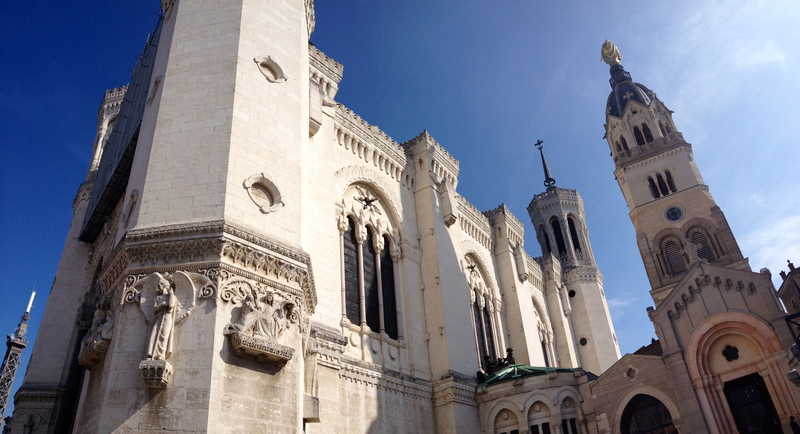 Sunday morning we awoke to a beautiful sunny day, perfect for our planned walk across the Saone and up to the Basillica de Notre Dame on top of the Fourviere. On our way we strolled through a Sunday morning farmers’ market set up along the banks of the Soane, where we admired the beautiful displays of fresh produce, flowers, and artisanal sausages, cheeses and breads; all of which smelled delicious. Coelle’s nose was twitching furiously! 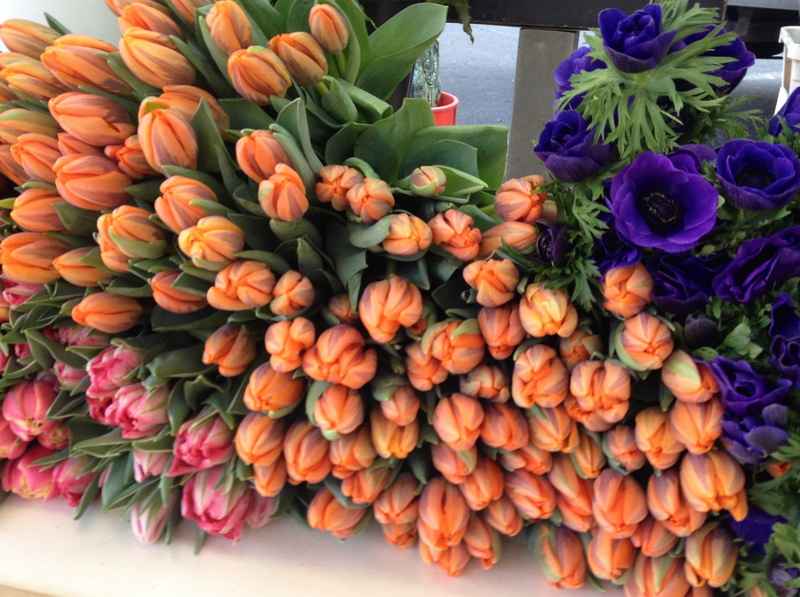 Fresh cut flowers at the farmers market in Lyon. 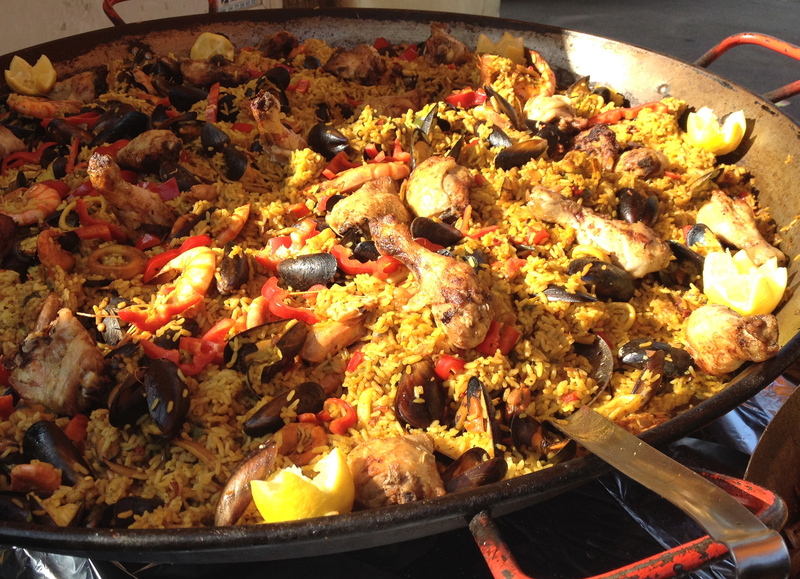 Not exactly French, but this paella looked amazing! 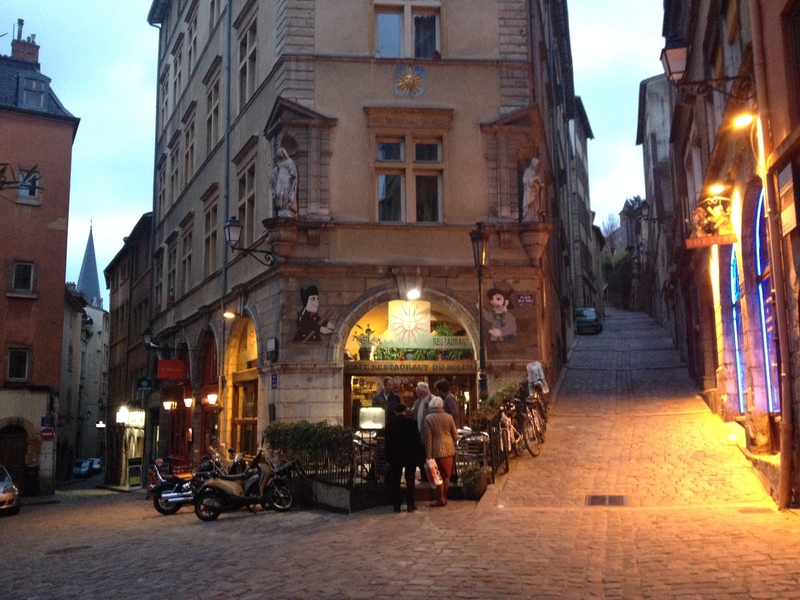 After crossing the Soane we again entered the streets of Vieux Lyon, where the climb up the Fourviere begins. While a few roads switchback their way up the steep hill, pedestrians can take a more direct and invigorating route to the top via a series of narrows stairways and paths, some of which are covered, called “traboules”. Upon reaching the top we admired the Basillica and the fantastic panoramic view of the city lying at our feet below the Fourviere. Crossing the Soane towards Vieux Lyon on the pedestrian-only Passerelle du Palais de Justice. 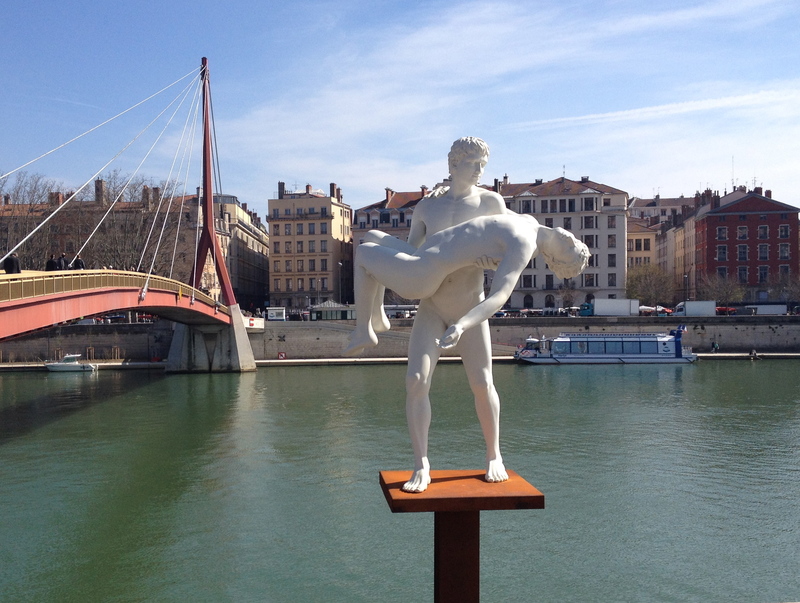 On the other side of the Passerelle we stopped to admire the sculpture, “The Weight of Oneself,” by the Scandinavian artistic duo Elmgreen and Dragset. 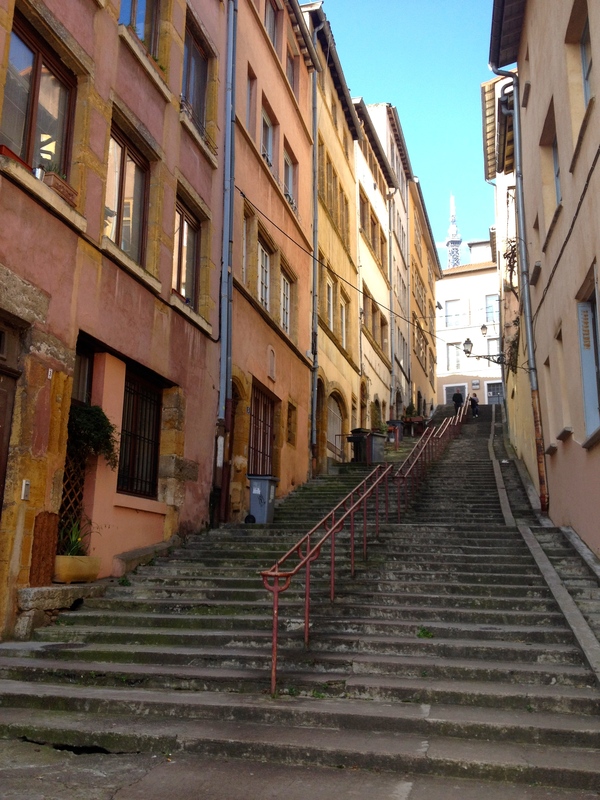 Heading up one of Vieux Lyon’s many “traboules”. Us and Coelle on top of Fourviere hill. Too soon it was time to leave Lyon, but not before making one final stop on our way out of town. Lyon, as it turns out, was the home of the Lumiere brothers (Louis and Auguste) who are credited with inventing the first motion picture camera and for staging the first public screening of a movie, which took place in Paris in 1895. 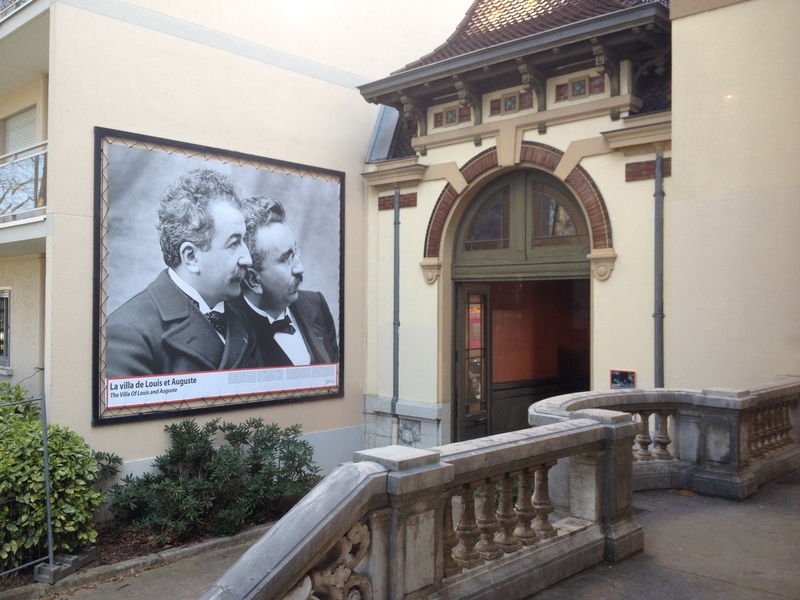 Today there is a fascinating museum – the Institut Lumiere – devoted to the brothers’ contributions to cinema and photography, which is housed in the original Lumiere family mansion where the brothers grew up. Entrance to the Institut Lumiere, in the original family mansion. The Lumiere brothers got their start in photography, thanks to their father having established a successful business manufacturing photographic equipment, and which had become a major employer in Lyon by the late 19th century. The brothers worked in the family business and, after their father retired, began experimenting with motion picture technologies, of which there were already a few precursors available, including Edison’s kinescope. Within a few years the brothers invented the first real movie camera – the cinematographe – which was patented in 1895. Within weeks the brothers shot what is regarded as the first real motion picture, a film of workers leaving the Lumiere factory in Lyon. The movie was recorded onto a 17 metre long strip of film which, when hand-cranked through the projector, produced a movie lasting 50 seconds. 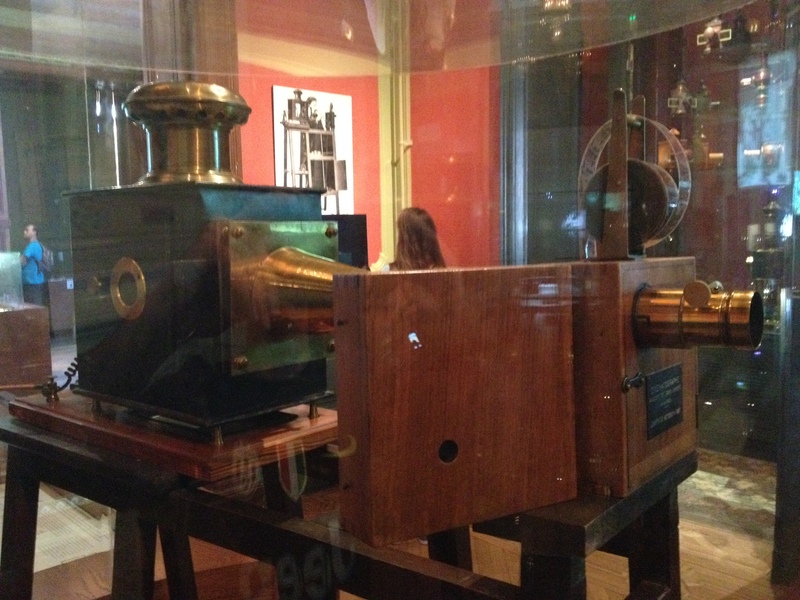 The Lumiere brothers’ Cinematographe, patented in 1895. After a few months of tweaks and private screenings, the Lumiere brothers put on the first paid public screening in the history of motion pictures, in the Salon Indien du Grand Cafe in Paris. Here the brothers showed 10 short films, including “Arrival of a Train at Le Ciotat,” which featured a steam train pulling into the station at the Mediterranean resort town of Le Ciotat. As the train pulled into the station, seeming to head straight towards the audience, some audience members were said to have leapt from their seats in fear of being run over. Over the next few months the Lumieres toured Europe and North America with their invention and films, causing a sensation. Thus the cinema and the movie industry were born. How fitting that the history of photography and the cinema should trace its roots back to the City of Light. Ironically, the Lumiere brothers saw their work on the cinematographe as a bit of a distraction and felt that the medium had no viable future. They soon abandoned their work on cinematography to focus on the family’s photographic business, where they made major contributions to the development of colour photography. The Lumiere name eventually disappeared from the photographic landscape in the mid 20th century after the company merged with Ilford, still a major producer of photographic products, including film, paper and imaging inks. We spent an hour or so exploring the museum and admiring its fascinating collection of early photographic and movie equipment, including an original cinematographe. The Institut Lumiere also sponsors photography and film exhibitions, and was in the midst of hosting a major exhibition dedicated to film and sport. Just days earlier, the Belgian cycling great Eddie Meryx had been there to introduce a series of cycling films. Merde! Missed that by a day or two. All in all, we were very impressed with Lyon and hope to make it back another time, perhaps to catch the Festival of Lights. The next time you’re in France, try to set aside some time to visit, you won’t regret it.